+ Hey there! Don’t forget to sign up for our exciting new email magazine, Soundfly Weekly, to get themed dispatches from the musical internet as well as new course announcements and discounts, and to learn a new musical skill every Tuesday! 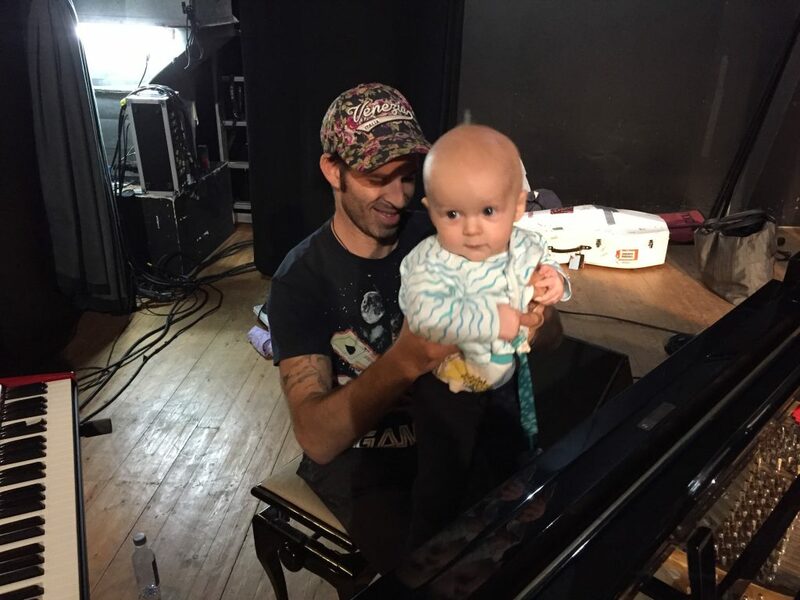 Shortly after my son was born, my husband’s band was invited to play two festivals in Europe, and the group decided to string a tour together between the two dates. So when our baby was four months old, we loaded up our suitcases and took him on tour. If you’ve recently had a baby, it can feel like life as you knew it is over. And to be fair — it probably is. But that doesn’t mean you have to give up all the things you really love. They just might take more planning than they used to. 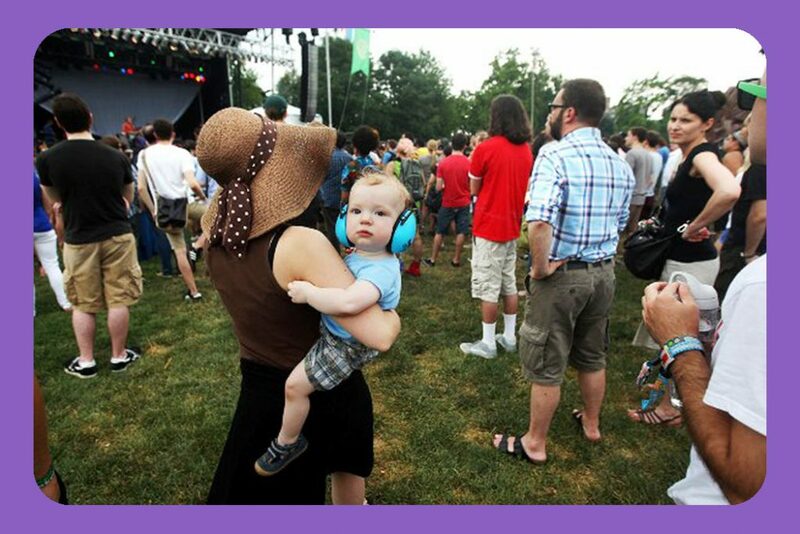 Since it’s Father’s Day this weekend, and you might be considering treating Dad to the kind of events he used to enjoy pre-fatherhood, here’s our in-depth guide to taking your baby to a concert. The kid watches on with varying degrees of rapt attention. Be safe. Don’t take your newborn, unvaccinated baby into a mosh pit. Daytime/early-evening shows are a lot easier to manage, unless you’re talking about a quiet concert with room for a stroller where you can just park a sleeping baby in the back. And lastly, be considerate of the artist on stage. Now, on to the pro tips. Don’t go to a show you aren’t prepared to walk away from. Or, in other words, always be ready to walk away. The easiest way to go to a concert as a parent is without your baby. If your favorite artist only comes to town once every five years and you’d die if you missed a song, get a babysitter. Get to the venue early and scope out the scene. You’re looking not only for literal “easy ways out” of the venue through a crowd, but also for places the baby can play and move around, or escape for a breather if the music if it gets too loud. Look for lobbies, handicapped bathrooms, lounges, a food or bar area, etc. — anywhere you can go for a reset mid-show. Plan your gear according to the venue. Try and find out a bit about the venue you’re going to, and plan what baby gear you bring accordingly. A DIY basement show is not the place to show up with your luxury SUV-sized stroller, wearing a baby carrier, with a car seat on your arm. But if you’re at a huge outdoor venue, you can load up that SUV stroller with everything for an apocalypse, and save yourself some serious back pain. You’re aiming to hit that sweet spot in the matrix of footprint vs. comfort for you and baby. For me, that usually means either a carrier/wrap or a small, foldable travel stroller, and a backpack for my supplies, as opposed to a shoulder bag. Food is a very effective tool for capturing and (briefly) holding a baby’s attention. If your baby is old enough for solids, load up your backpack with a variety of different snacks — a mix of their favorites, and new foods they might be interested to either eat or play with — and you’ll be ready to stop meltdowns before they begin: crackers, fruit, pasta, pouches, whatever — the more options, the better. Only show the baby one at a time, so that each new snack buys you a few more minutes of quiet attention. These same principles of variety and timed release hold for whatever best captures your kid’s attention — toys, storybooks, etc. And use baby to make friends with fellow fans, or even the band. New faces will hold their interest for a little while, plus everyone loves an aspiring synth wizard. Be kind to their ears. Babies have super sensitive hearing, and every sensory experience is new for them. My kid happily slept through a deafening, 10-artist experimental music jam session, featuring some of the loudest drums I’ve ever heard, but he’s totally freaked out by acoustic guitar. You never know what’s going to set them off. Finding the right ear protection will not only save their hearing (so they can destroy it themselves 13 years from now on a drum kit in the basement) — it can help them nap, and it will defend against the untenable tones of quiet campfire guitar. I know a bunch of parents who have had luck using their own sound-canceling headphones on their babies, and you can also buy air-traffic-controller-style, noise-absorbing headphones at most baby stores. But of all the options, this noise-reducing hat has been the most successful in our household; my son’s a lot more tolerant of it than he is of the big headphones. Hush Hats have built-in foam earmuffs to dull loud noises. Carefully consider a second pair of hands. Having someone else to help you entertain your baby can be a big help — but choose wisely, and make sure your partner is either a helper or someone who’ll be okay on their own if you have to bail. This is not the activity to share with your childless friend who wants to have quality time with you, or with a friend who will be upset if you disappear. When you’re planning for a show in the future, consider future age and abilities. If you’re buying tickets to a show a few months out, take into account what your baby will be doing when they are those few months older. You might not be able to imagine leaving the house with a newborn, but by the time the baby is three, four, or five months old, they’ll be on a more regular nap and sleep schedule, and they’ll be more used to sleeping in their stroller, car seat, or carrier. You might be able to get away with standing in the back of a venue with a baby sleeping in the stroller next to you, or dancing in a more crowded space with the baby in a carrier. As soon as that baby starts crawling, though, you’ll want to think about surfaces, should they want to squirm and get down on the ground. A grassy park show would be great; beer-soaked plywood, not ideal. If your baby is anything like mine, once they can walk, they won’t want to stop — so be sure the show isn’t somewhere they’re likely to get trampled as they’re toddling around. Be emotionally prepared for public meltdowns, and try not to kill yourself managing them. You’ll get dirty looks, but just remember — all those people giving you the stink eye were once babies, and at some point in their lives, their crying annoyed an adult. It happens. Be accepting and flexible, and don’t stress too much. But remember that you chose to bring a baby to a concert. On the flip side, a concert is, by most accounts, an inappropriate place to bring a baby. Everybody is there either to make or listen to music, and a crying baby gets in the way of both. So try to be respectful both of your fellow audience members, and of the artists performing. If your baby is making it hard for people to hear, or for the band to concentrate, it’s your responsibility to do something about it. Do you have an experience taking your baby to a show that others could learn from? Tell us in the comments below!